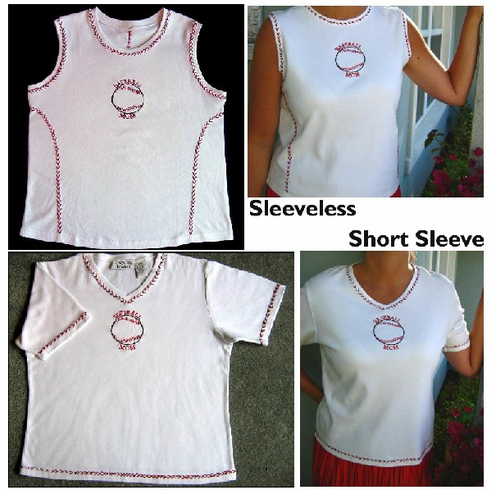 Baseball Mom S/M Short Sleeve White Tee. These Baseball Mom white tees are perfect for baseball moms at all levels of the game. Show your pride by wearing one of these 100% cotton tees. All logos and baseball seams are hand stitched. Sleeveless and short sleeve designs available. Sleeveless S/M - 19 Width, 21 Length, 38 Chest. Sleeveless 1X/2X - 23 Width, 23 Length, 46 Chest. Short Sleeve with V-Neck S/M - 20 Width, 21 Length, 40 Chest.